A local dye plant was experiencing problems with 2-way solenoid valves on their water and chemical lines. The solenoid valves had low Cv’s which slowed down their process time and the diaphragm seals would not seal properly, resulting in leaks downstream of the valves. Ultimately, the leaky solenoid valves were causing batch rejections. Assured Automation was contacted to suggest a valve that could provide bubble tight shutoff on a high cycle application. Angle valves were presented as a solution to their problems. The angle valve offers a high cycle life (up to 5 million cycles), a bubbletight shutoff teflon seat, and a much higher Cv to reduce their batch processing times. The fast cycle speed of the angle valve was ideal for their precise chemical dosing. Angle valves successfully replaced the 2-way solenoid valves and solved the dye plant’s problems and is now their valve of choice for all media. 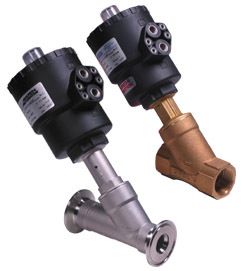 The Assured Automation angle valve is offered in brass or stainless steel body, 3/8” to 2”, End connections of NPT, Flanged or Triclamp, Fail Closed, Fail Open or Double Acting. This entry was posted in Latest News and tagged Angle Valves, Ares & Zeus Series. Bookmark the permalink. ← Can Plastic Water Meters Foil Thieves?